Stick a Fork in It – The Chairs are Done! 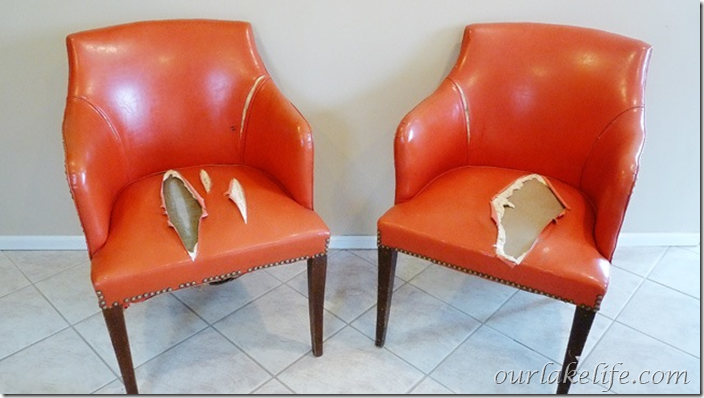 Remember my great-grandmothers formerly orange torn, ripped and cracked faux leather chairs? Well I finally got on that and finished up the last little odds and ends that were hanging out so that we could officially check these guys off the old to-do list. I’ve been planning this update for years and quietly hoarding these chairs away in the attic until I got crazy brave enough to try this project out on my own. I could never bear to part with them, over the years they hopped from attic to attic as we moved waiting for the right time and place for an update. They looked OK from far away and I even grew somewhat fond of the bright orange color. Upon closer inspection they were a bit of a mess, covered in old Naugahyde that had cracked and become sticky to the touch over the years. They smelled musty and dusty and had a weird crinkle to the seat when you sat due to the original horsehair stuffing. After years of waiting it was finally time to get on it and fix up these diamonds in the rough. I debated a few different options including re-covering them in soft buttery leather or black velvet. In the end I found some great neutral upholstery fabric on the cheap from eBay, clicked bid and the decision was made to keep the chairs neutral. I think it was a good choice since our bedroom already has a ton of color thanks to the curtains and pillows I made. 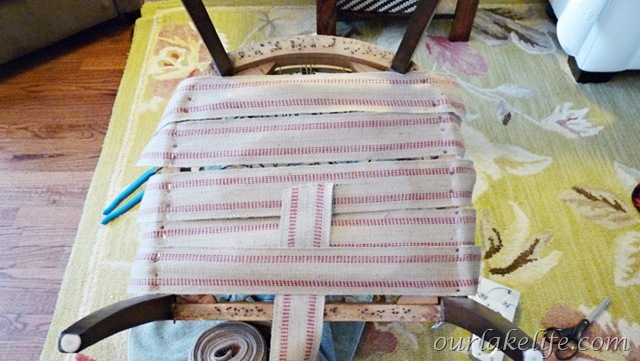 First I removed all of the fabric from the chair down to the bare frame. The only thing that was left in-tact were the springs, held together by the hand tied twine. This was the messiest part of the job. I had been hoping to leave some of the original insides in tact but once the fabric was pulled away it became clear that everything needed to be replaced. There were 5 bags of garbage from these two small chairs! We took the chairs out side and did some repair work to the legs. They had become wobbly in spots and needed to be sanded and stained. Bryan used his Kreg jig to drill a few pocket holes and slid a few screws into place to hold the front legs secure to the frame. 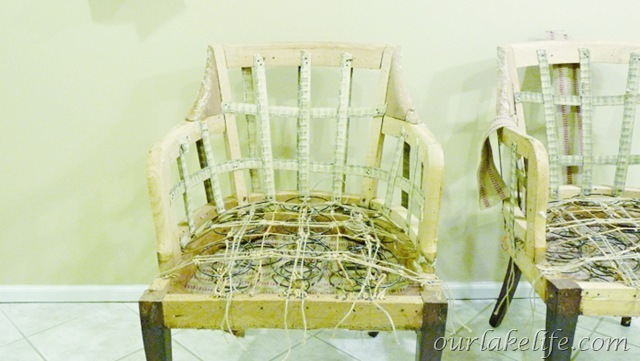 The jute webbing that holds the entire seat together had disintegrated in places and had a very musty smell that was only going to be fixed by replacing it. I redid the entire seat by stapling it to the bottom and weaving the jute strips for form a tight base for the springs. After watching a few videos on YouTube I began retying the springs in spots to make sure they were nice and secure. Added new foam to the seats to replace the old dusty horsehair (it seriously smelled awful) and covered it in some batting and an under layer of fabric in the same manner as I removed it. Just in reverse this time. They sat like this for some time while I gathered the rest of my supplies and thought about how to tackle the rest of the project. I felt a little paralyzed for a while, knowing there was still a lot of work to be done. Eventually I just decided to dive right in and finish them up. 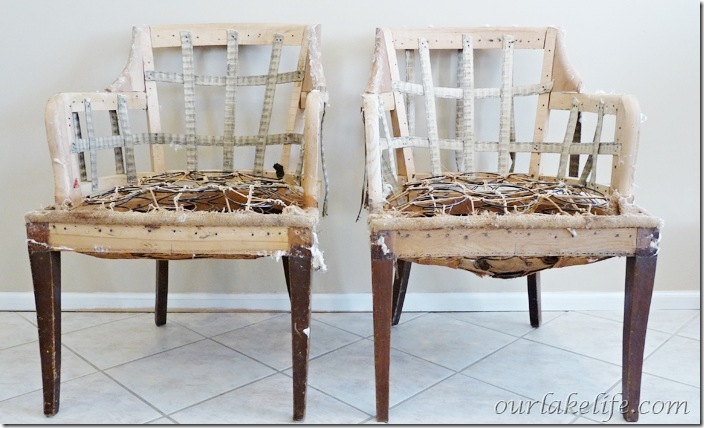 After a few days and some late nights of cutting, sewing, stapling fabric and hammering nails I had two fantastic vintage chairs that we are loving. 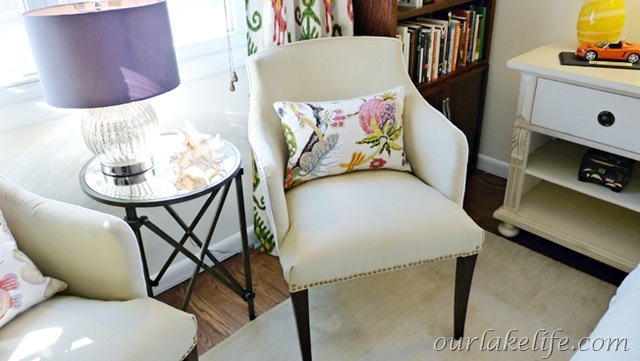 To add subtle contrast and highlight the lines of the chair I sewed piping in white denim and added old-fashioned nail head trim to the chairs I think it shows it off just enough to be elegant and refined. In person the neutral fabric has a subtle hint of green in certain lights. It’s a heavy weight brushed upholstery grade fabric that is soft to the touch but should hold up to years of use. So the verdict? Even though I had grown fond of the old bold color, I’m really happy I decided on a neutral fabric. 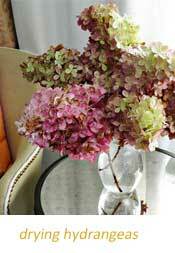 They’re classic, fresh and they blend seamlessly into the room. 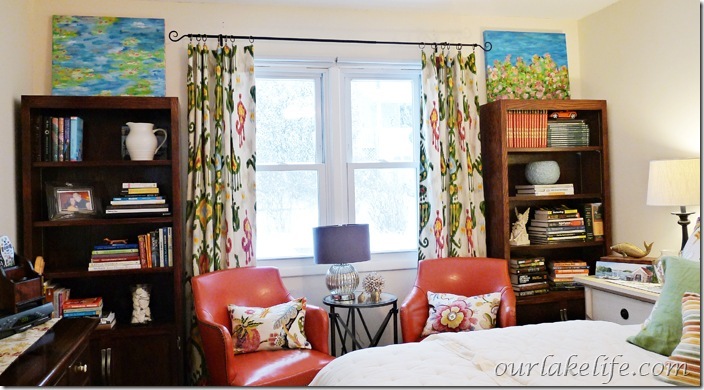 Another perk is that they look fantastic in other rooms of the house too. I’m almost tempted to steal them for another room…almost. Just so you don’t have to scroll all the way up here’s how they looked when we brought them down from the attic and dusted them off. And now dun de dun dun… the after. It’s so wonderful to finish up a big project and have it turn out like you had imagined. With that we can mark off one of the last big projects on this Master Bedroom makeover. We still have a few things to do like adding a new head board, refinishing the dresser and sprucing up the closet doors. But those projects are for another day. 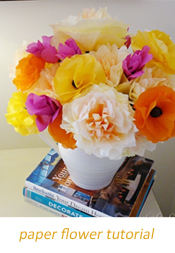 They’re absolutely gorgeous – I’m so impressed you did that yourself! Thank Beth 🙂 I can’t believe I did it myself either. There was lots of doing and undoing to get it just right though. You did a beautiful job, they look great. wow! your chairs turned out GREAT! i love everything you chose to do with these chairs, bravo! 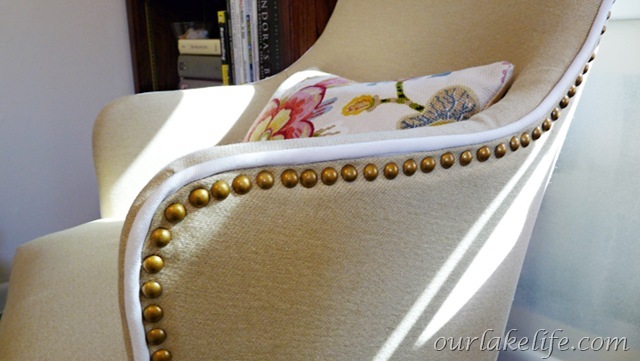 Upholstery projects always feel daunting in the beginning, but once you’re done all the hard work was worth it! May I ask – where did you get your nailheads? I’m on the hunt to find some good ones. Hi Brittany, Thank you, I bought a 2 lb box of nail head trim at the link below. 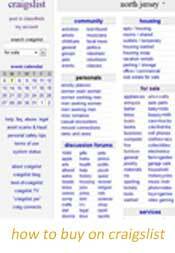 I love their site and they have all kinds of good upholstery products. In my opinion it’s one of the best upholstery supply shops on the web. I had tons left over after doing the chair which is good because I think I’m a nail head trim addict now. Hope it helps. Wow those chairs look absolutely beautiful! Nicely done!!!! 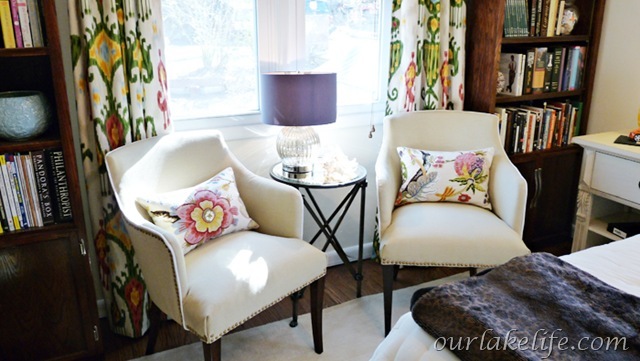 Love the white fabric and the pretty pillows! Just beautiful! Thank You Becky, I want them for my Living room too. They turned out wonderful! You did such a great job! These chairs turned out awesome! 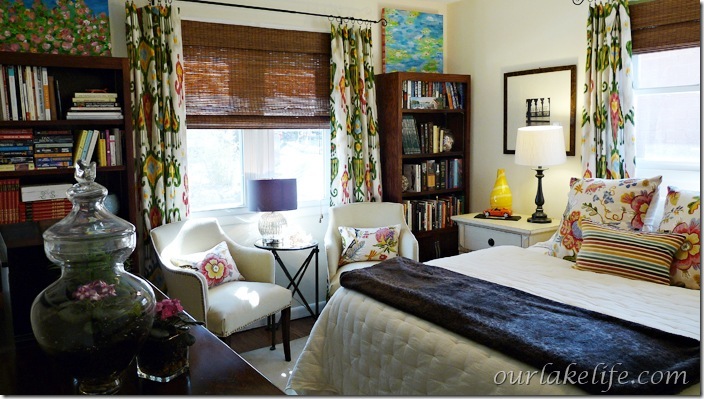 I know how much work went into this project….especially all the brass tacks….not easy! Thanks for sharing! Thanks Erika, those brass tacks were not fun at all, but worth it in the end. They look amazing! I like the neutral color in your space. Holy cow! Give yourself a pat on the back and buy yourself a drink! Beautifully done. Hi! I just love your chair makeover – what a labor of love that was. I would love to try to do upholstery…but I think I just may stick to painting (I am much better at that!). But I love what you did – it may be just the thing that inspires me to do the impossible (re-do a chair!). Found you on Miss Mustardseed’s blog. Thank you for your lovely comment.The draperies are Robert Allen Khandar in Jewel and the Pillows are Braemore Wonderland Pearl. I will come stop by and take a look. Absolutely beautiful. Just love the color and the material thatyou used, even though I loved the orange also. Did a great job. Thanks for sharing. What a great reupholstery job! 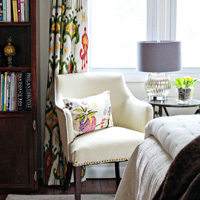 Those chairs look fantastic and so do your ikat draperies . 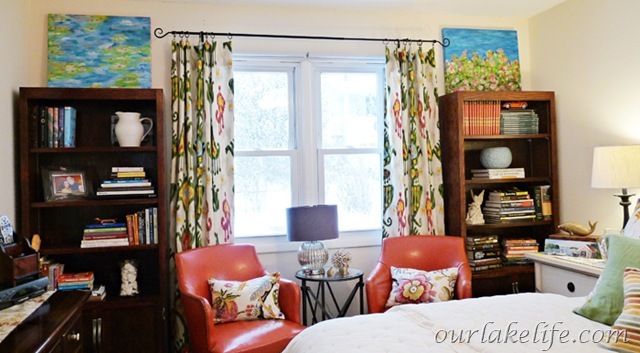 What a colorful happy bedroom to wake up in everyday! I live in NJ too, in beautiful Hunterdon County. Found you at Exceptionally Eclectic. Can’t wait to look thru your blog! Thanks! Thank you, So happy you’re enjoying the blog. Always nice to have another Jersey girl around here. Wow! I’m not sure I would ever be brave enough or crazy enough to tackle an upholstery project of such a large size. Kudos! They look beautiful! Haha I felt crazy while I was doing it. Thank you it was worth the work. Adorable: what a great transformation! We just purchased two wingback chairs covered in hideous fabric… I’m SO tempted but even MORE afraid to reupholster myself! You did a great job though! Thanks Chrissy, It was a lot of work but very worth it in the end. What an amazing redo. You did a great job, I love the piping on the chairs and the nail head trim! They look awesome. This type of project intimidates me. You did an amazing job on these chairs. No one would believe that the orange ones were the same chairs! Seriously wonderful chairs! I’m in the middle of a chair reupholstery job myself… unfortunately, I seem to be stuck and not getting anywhere. Maybe if I put it in the middle of my living room I’ll get it done. I hope it looks as good as yours do!! Thanks, Yes having it in the house forced me to work on it. I got stuck too, but finally got sick of the mess and I kept plugging along. I agree with Beth. Fabulous work and I too am impressed on your skills. I usually don’t get past the procrastinating stage. I love the way the reupholstered chairs give a different feel to the room too – even more classy than before. Thanks Lisa. It was a lot of trial and error. I had to redo the chair backs a few times before I got it right. You did a smashing job on these, and they are good for another 30 years. I’m drooling over your drapery fabric-where did you get it? Did you make these drapes, too? Brava!. Thank You, I hope they do stand the test of time, that would be fabulous. Yes I made the drapes too 🙂 They are Robert Allen fabric in Khandar Jewel. My jaw is on the floor!! These are so gorgeous and I just love the lines of the backs! My husband just brought home a destroyed couch for me to recover so this is perfect timing! 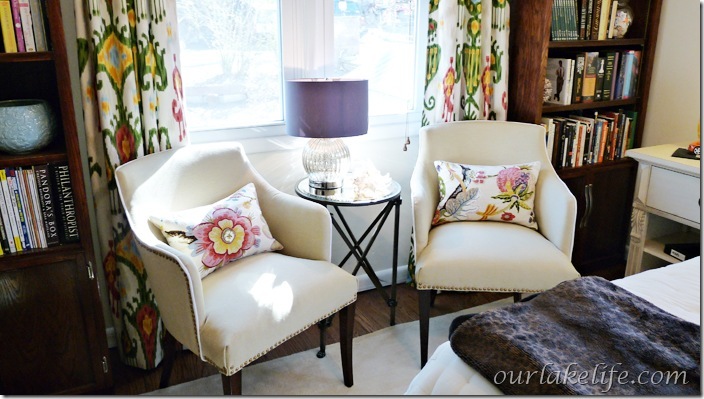 I’m planning on going neutral with a bright throw pillows so I’m thrilled to see how well it works here! Pat yourself on the back!! Thanks Natalie. I love them and they’re holding up great. I was scared to start such a bid upholstery project but I’m so happy I took the plunge. Gorgeous!!!!! You did a brilliant job! May I ask where you got the drapes? Love them too. Thanks, I made the drapes. The are Robert Allen’s Fabric Khandar in Jewel. There’s a link in the sidebar to the full DIY breakdown. I actually only did one other upholstery project before. I a little sewing experience so that help some. The key was to pay attention as you took it apart and I also watched a TON of upholstery videos on youtube and found a really great upholstery series on Design Sponge. You were right to hold on to those chairs. Now they are amazing! Job well done. Thanks Mel. I love hem too and it only makes them all the more special because they’re sentimental. That is an amazing transformation! You are seriously brave. I love your curtain fabric, also. I just found you on Southern Hospitality and am now following you. Thanks Angela, so happy to have you! I am so envious of your drive! You did it! Perfect! You learned that from You Tube?? I am so impressed! Great job especially with the piping and then the nails…. Thanks Nancy, It was a combination of you-tube and other tutorials. It’s amazing what you can learn to do by watching you-tube videos. 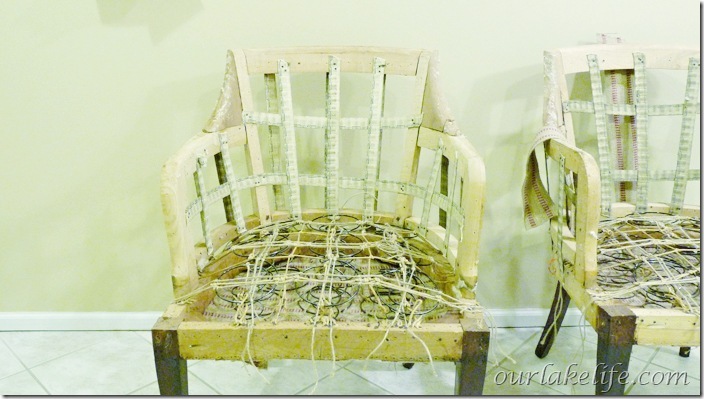 Thanks Jami, I love French chairs…now you’ve got me thinking. I may have to find a few of those myself. Thanks for stopping by! Greetings from Idaho! I’m bored at work so I decided to browse your blog on my iphone during lunch break. I enjoy the information you provide here and can’t wait to take a look when I get home. I’m shocked at how fast your blog loaded on my mobile .. I’m not even using WIFI, just 3G .. Anyways, very good site! What a job well done! 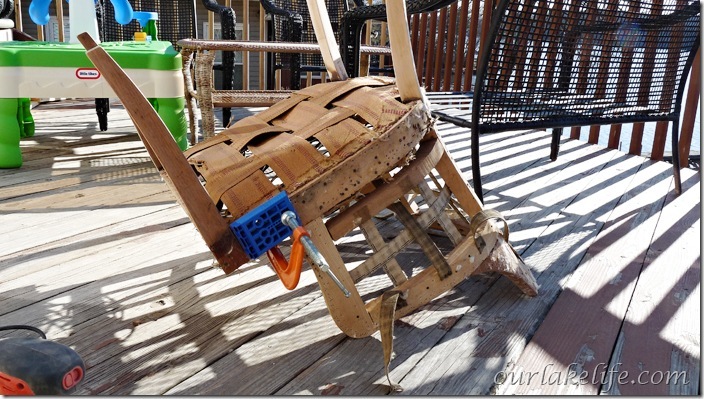 I have been wanting to try a project like this but then get nervous thinking the chair will end up looking nasty. You made this look easy, and have motivated me. Thanks Cornelia, It was a lot of trial and error and patience. YouTube and internet tutorials were my friends through the whole project. Amazing job on these chairs!!! Gorgeous fabric and love the piping and nail head details!! 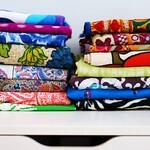 Very inspiring- I would love to tackle a project like this too!